There aren't that many bands from Portugal which made themselves known in the metal community, now another band tries to leave their footprint - Fantasy Opus. To be honest, I haven't heard about them before and was stunned to learn that they are active for almost 20 years! 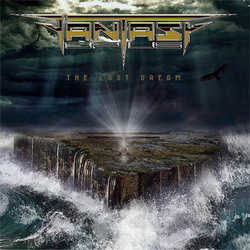 The Last Dream is their second album, as far as I could find out.... Their debut Beyond Eternity was released in 2009. The opener Ritual Of Blood shows their passion for power metal with neo-classical elements and a progressive edge - and an appreciation for bands like Gamma Ray, Angra and Symphony X.
Leonel Silva has a powerful voice and varies a bit, but the strong point of Fantasy Opus is lead guitarist Marcos Carvalho who seems to be inspired by Yngwie Malmsteen, Jason Becker and Marty Friedman. Chosen Ones kicks of with some neo-classical guitar frenzy, then slows down, just to become a true power metal tune with epic choruses. Unfortunately singer Leonel Silva is pushing too hard and so his limitations show. At the ballad Lust he mainly stays in his comfort zone, but here and there is pushing the limits again. But still the powerful voice accompanied by guitar are a powerful combination. Later in the song they go full force and the guitar takes over the melody line, just before a break leads them back to the opening theme. Back to up-tempo power metal with Conquer The Seas which is partly dominated by Carvalho's guitar play. Epic vocal parts and sing-along choruses make this one a song which live will create a special magic. Spoken words accompanied by guitar leads into Black Angels, even when Silva starts singing it stays balladesque and the band stays in the background. After app 5 minutes the song becomes a melodic rocker, followed by Every Scar Tells A Story. With Perfect Storm they present the longest track of The Last Dream, slowly it begins and develops into an orchestral epic tune. The orchestral passage reminds me lightly of Savatage's Hall Of The Mountain King.... Even if I can't get a grip on which classical piece influenced the Portuguese. Later there are Queen-inspired choruses meeting 70's organ extravaganza which drifts into a slightly chaotic passage - just to get back to a balladesque part dominated by Silva's voice. This is a sonic roller coaster ride of almost 13 minutes! Oceans is a kind of interlude with less 2 minutes and leads into Realm Of The Mighty Gods, a track based on fast double bass drumming, sing-along parts and melodic guitar passages. The closer is called King Of The Dead and combines the different elements of Fantasy Opus' sound, there is a slow part which is first only drums and bass, but later the guitar joins in and sings. Towards the end they return to the main theme.